Onto Part 2! Missed Part 1? Read about how this family chose to labor at home here. It was a quiet December evening. This mama had spent the week of her estimated due date surrounded by the love and support of her family, who had flown in from Houston to be with her. "I was so excited to have my mom and Cardad in town from Texas as they had been there for all of my nieces' and nephews' birth days and Hootie was no exception to them. My Cardad who helped raised me from two years old and my mom who has MS made an absolutely Herculean effort to get there, since traveling is super hard for Mom. The first couple days I was so consumed with getting Hootie to come until I realized that God was keeping Hootie safe and sound in my belly so that the four of us, Mom, Cardad, Carson and I could really enjoy each other. So the rest of the week we explored and hung out, ate, and organized the house. It was exactly how it was supposed to happen! On the day I went into labor, my Cardad unfortunately had to leave right after my water broke, which was heartbreaking to say the least, but my mom got to stay and seeing her fighting through her MS to stay awake and alert for whatever I needed gave me so much strength." After saying goodbye to her Cardad, Mama spent the rest of the day laboring at home and enjoying the last few hours with her baby safe within her. 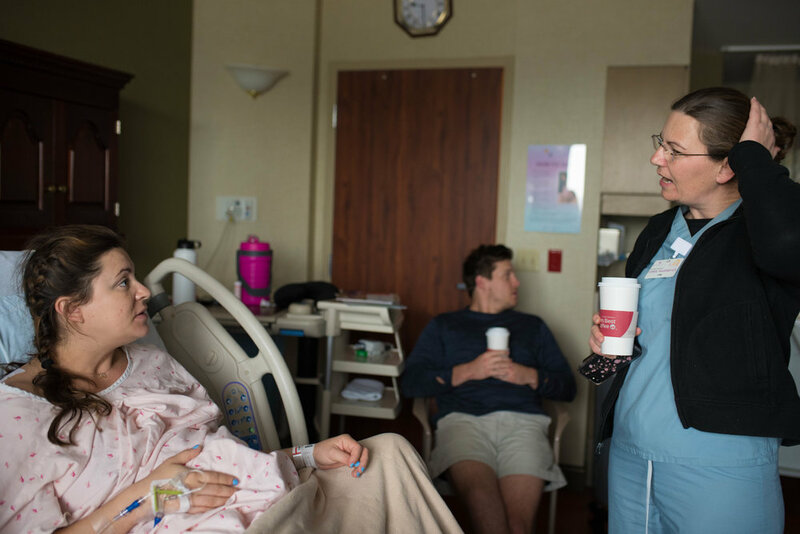 Nearly 11 hours after her water broke, this mama decided, with her doula and husband, that it was time to head towards the hospital to meet their baby face-to-face. I hopped in my car and followed them over to St. Vincent's Southside, where the talented staff of Full Circle Women's Care would be meeting us. Mama had to take a few deep breaths and work through a contraction before she was ready to step out of the car. Car rides + active labor = a big challenge. She was happy to have that part of the journey behind her! What a sight we were: this big birth crew hiking through the parking lot with our duffel bags, backpacks, and birth ball! Later on in the evening, we met a nurse who had seen us walking in as she was starting her shift. She said she got a chuckle seeing such a loud, excited bunch! But of course, moments between contractions grew closer and closer together, and mama had to once again pause, focus, and relax. She always made sure that her hands were loose and open during contractions, and that relaxation spread to the rest of her body. This was one of the COOLEST, most goose-bumpy moments of the night! After driving for 8 hours, dad's parents just happened to walk through the hospital doors right as the laboring family was getting into the elevator! We all knew we were in for a really special, unforgettable night. These grandparents were so excited to meet their very first grandbaby! Paperwork, paperwork, paperwork. Hint to expecting moms: if your support person memorizes your social security number, date of birth, and date of your last missed period, all you have to do is sign! After focusing through a strong contraction, mama said to dad, "Please don't touch my forehead." He quickly apologized and asked if it was uncomfortable. "No," she said, "but my eyebrows look really good and I don't want you to mess them up for Dallas' pictures!" Ha! Mom, dad, and doula Ali headed into triage while the rest of us hung out in the waiting room for a bit. It was nice to catch my breath and call my husband to say goodnight before we headed back in to join the fun. Midwife Carol Rademeyer was the midwife on call for this birth, and they couldn't have been more pleased to see her. Filled with her family and support team, the room was practically buzzing. Big sister doesn't do needles! Could she be more gorgeous? I love the intimacy, peace, and excitement of this moment. They were ready to meet their son. This image also shows something deeper and really special below the surface. Very often, when laboring women arrive at the hospital, their labors stall or slow down. The florescent lights, new faces, taking off your comfortable clothes and putting on a cold gown, strangers putting bands on your arms and monitors on your belly...all of these factors can bring out an instinctual fear in our primitive selves. But here at St. Vincent's, with the phenomenal Full Circle team, this family was welcomed with excitement and respect. Rather than feeling fear or anxiety, mama felt excited and energized. She was 3cm dilated and working hard! A family of believers, they decided to pause and pray over mama and baby. They prayed that the birth would go smoothly, and that God would protect them. They thanked God for bringing this sweet baby to them! Her pressure waves picked up in intensity, and she began to request comfort measures, such as guided breathing and massage, to help her blow through them. Baby had settled in nice and low, and the top of her stomach, which had earlier been firm, was now soft and empty. Baby boy was nestled in deep! Mama used a variety of different positions through her labor. She squatted, laid across the bed, sat on the toilet, "slow danced" with her husband, and got on her hands and knees. Movement in labor helps baby to do his part to wriggle into the best position for birth. After several hours of intense contractions, the shower provided some big relief. Dad diligently held the shower head, sending ripples of warmth across her hardworking muscles. Mama said later that at a few key times in her labor, the shower was the only thing that brought relief. It didn't even phase dad that his shoes were getting sopping wet in the shower. He was so focused on encouraging his wife. They spent an hour in the shower, praying together and breathing in sync. There is a point in almost every labor, where one goes from riding the waves of the contractions to surrendering to them. There is beauty in this process, and it requires so much strength. Straightforward, honest, direct words of encouragement from her sweet doula friend. "You can do this. I know you can. You know you can." I was just so impressed with Ali, their doula. Throughout a long, exhausting labor, she was never more than an arm's length away and gave gentle, calm advice. She squeezed her hips, provided lower back counter-pressure when needed, and used the tools in her doula bag to provide relief from the surges. But it really is her heart and her deep wisdom about the needs of a birthing woman that makes her such a top-notch birth doula. At this point, everyone felt like baby was close. Mama was starting to feel "pushy." Her vocalizations changed and she had to stay "down" in between contractions instead of coming back up to talk and laugh with us. The nurse turned on the baby warmer. Eager sisters, who had each had their own babies, seemed to recognize this shift in their little sister, and were excited for what was coming. This is one reason why I love the midwifery model of prenatal care. Carol got down to mom's level, put her arm around her, and whispered words of encouragement in her ear. At about a quarter after midnight, mama agreed to have a cervical check, since it seemed like she might be ready to push soon. Moms often choose to have a cervical check before they begin pushing, to be sure that they are fully dilated and not putting pressure on a cervical lip that might still be there. Hard, hard news. After being in labor for over 16 hours, her cervix was only dilated to 4cm, just 1cm more than when she had arrived at the hospital. This was a moment where I picked up my camera, took the shot, and then left it at my side for a while. She needed space to process her emotions, and in that moment, I was there as her friend and not her photographer. "Support is so important," she told me later, as she was reflecting on her birth story. "Everyone involved played such a huge role. Without them I wouldn't have been able to do it." She sobbed. She moaned, cried, and lost it for a few good minutes. She surrendered to the process and let go of her own expectations for her labor. She rose to the challenge. She stood and met her fears with power and strength. She blew through the pain and dove right back into the process. Grace and grit, my friends, grace and grit. "My mother-in-law was praying, my mom was telling me to trust myself, my sisters were constantly telling me how proud they were of me, Ali was a super doula, and my husband squeezed my hips and offered me snacks and water every 2 minutes. Not to mention my dad, stepdad, and father-in-law making sure everyone was getting rest and taking care of the caretakers all week." Lower back support can be so critical in powering through contractions. Between hip squeezes and lower back pressure, this dad had his hands on his wife for pretty much her entire labor. After several more powerful hours, another cervical check. She had progressed to 7cm. This mom is a prenatal fitness expert, and she was able to specifically identify a very real concern: she wasn't able to relax her pelvic floor. In between contractions, she could release the tension there, She was able to relax those muscles in between contractions, but during a surge, as much as she focused her relaxation on that spot, she felt her pelvic floor tightening instead of softening. She had a calm, respectful conversation with the nurse, her husband, and her doula, and she requested an epidural. Having such extensive birth knowledge, she knew that she was likely far enough into labor that an epidural wouldn't necessarily slow things down, and that it might help her relax those critical muscles that were so tense. She also knew that she needed to preserve her energy to be able to push her baby out, and after being in labor for 22 hours, that was important. About an hour later, the morning sun rose on a new day. Everyone had a renewed sense of energy, and mama was relaxed and optimistic. She had a cervical check, and...yay! 9cm! Carol put her in a "princess pose" to help her continue to progress and keep baby nice and low. At this point, it was just a waiting game. We watched How I Met Your Mother, munched on hospital snacks, and talked. Soon enough, she got to 10cm! Rather than trying to push right away, the midwife encouraged her to do something called "laboring down." 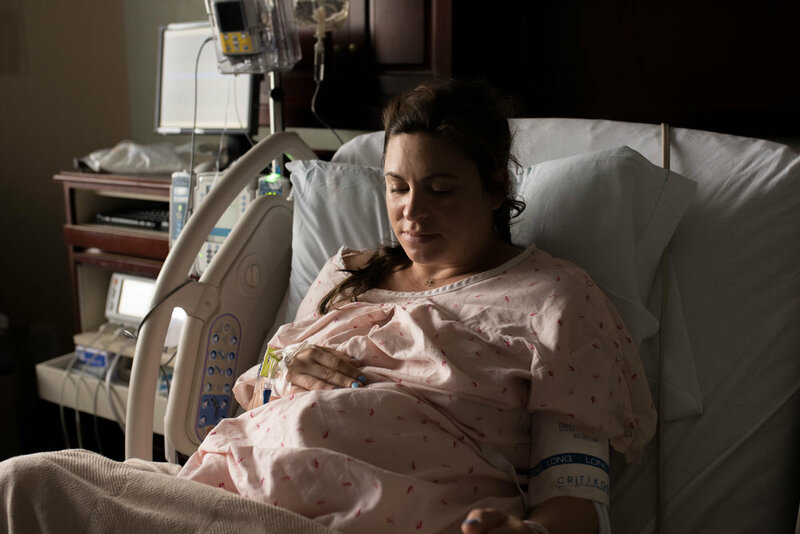 This was a new concept to me, but it is basically for women with an epidural who are fully dilated sitting and waiting before pushing, so that their contractions will go ahead and bring baby lower and lower. Laboring down helps to prevent tearing, and often means that the time spent pushing is minimized. So we had some more waiting to do! The slideshow below shows the pictures that he took! I was really impressed...and really grateful! 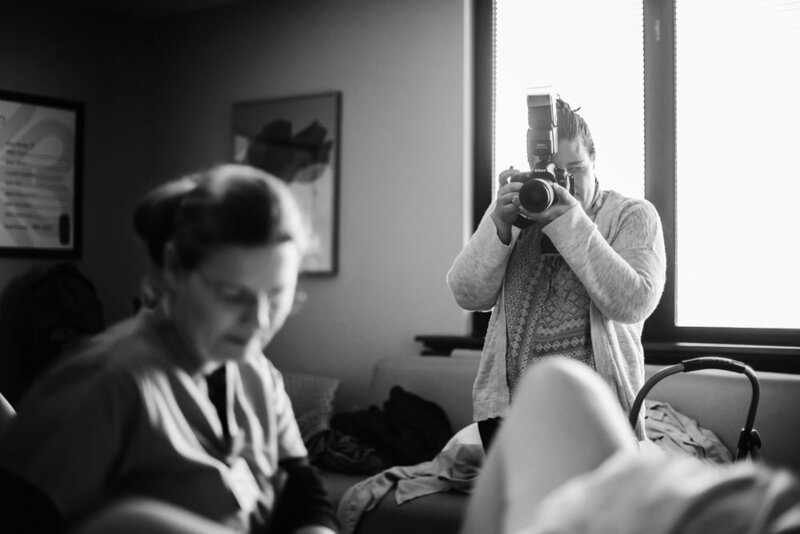 I have never had pictures of me in action, photographing a birth before! There was another dynamic going on during this birth: mama's sisters and dad had rescheduled their flights and needed to leave in order to get to the airport on time. As excited as everyone was that mama was at 10cm, they completely understood the benefit of laboring down, even though it meant that they would miss the baby's birth. They were so selfless and never questioned mama or her midwife, and even after waiting for so long, they knew this was best. She had already had to say a tearful goodbye to her stepdad who supported her the week before, and through her early labor, so having the rest of her family leave at this critical moment was hard, too. But, like all of the difficult moments she had endured so far, her focus and her family's love, near and far, kept her going strong. But a few minutes later...some good news! Her sisters had somehow managed to get on a later flight and had 2 more hours to stay! Soon enough it was time to start pushing! The nurse brought in a big mirror on a pole so that she could see what she was doing. 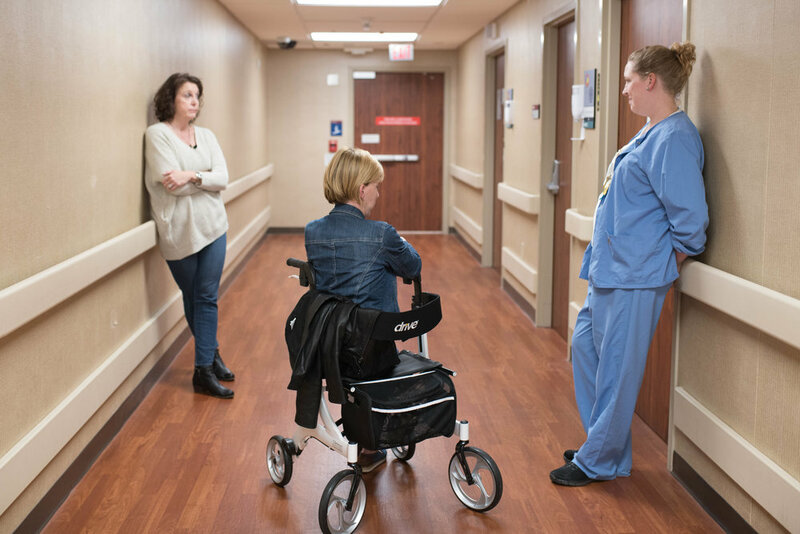 For women with an epidural, the mirror helps to provide biofeedback, so that pushing is more effective. I think this is dad's, "...how is she doing this?? This is incredible!" face! Time to glove up! Baby catching time! Dad pulled off his shirt so that he could immediately hop into bed and be part of that wonderful skin-to-skin baby bonding. You know baby is almost here when the warm towel comes out! And here he comes! Cue the waterworks! Baby had the cord around his neck (very common and rarely any kind of a problem), and so Carol had to help him through the cord before dad reached in and handed his son to his wife. A new family's first cry! Not going to lie. I was ugly sobbing during this moment. Like, wiping tears off of the back of my camera sobbing. It was such a beautiful sight! After the cord stopped pulsing, they clamped and cut it. Carol was so generous and helped me get a great angle for this shot which often happens so quickly that it's tough to catch! Such a sweet, fuzzy little head. And of course, a beautiful placenta. 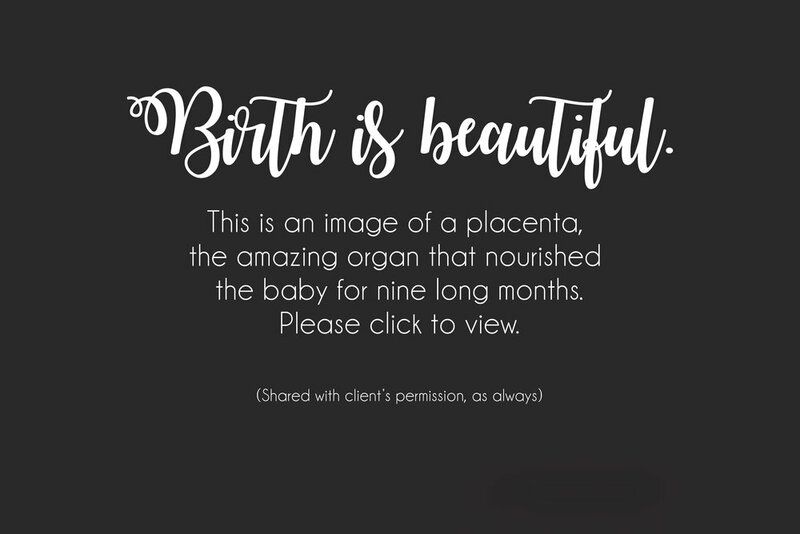 She had her placenta encapsulated, a practice that is becoming more and more common. Ingesting the placenta is said to help with milk production, energy levels, and mood. And the next hour breezed by with lots of laughs and some happy tears. Seven pounds, seven ounces! A perfect little man! Months ago, during their preconsultation, dad had expressed how much he was looking forward to his first skin-to-skin with his son. It was a really beautiful and meaningful moment. With immediate breastfeeding support, baby was able to latch right away. Welcome to our side of the belly, little guy! Your mama worked so hard and so long to bring you into the world, and you are so very loved and wanted. Want to see more of this beautiful little family? Click here to see their newborn session, or read part 1 of their birth story here! How will you remember your birth? I would love to be part of your birth team! What kind of birth are you envisioning?